Sycamore School | A Private Day School in Indianapolis, Indiana. Parent tours are available most Wednesday mornings from September 2018 through May 2019. We start at 9:00am! Call Erica at 317.202.2544 so we can be ready to greet you! There will always be students who need schools like Sycamore, to stimulate, educate, and motivate our best and brightest. We are educating kids, teaching them to think, both critically and creatively, and teaching them to love learning. Today's students will be the leaders that will solve the problems of today and tomorrow. Sycamore is a prime example of institutional evolution and a story of response to a need. Our work will never be complete. We sat down with Sycamore middle school history teacher Tony Young ahead of his annual journey this week with the 8th graders to Washington, DC. He talked about the sites they choose to tour, what the trip instills in our students, and how the Tomb of the Unknown Soldier is a powerful piece of their trip. Six Sycamore VEX Robotics teams claimed bids to World Championship as the Sycamore CyberEAGLE competed with over 400 robotics teams from across Indiana at the State Championship on Saturday at Lucas Oil Stadium. The World Championships will be April 24-27 in Louisville. 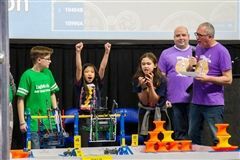 All of the teams advancing (two 5th grade teams and four Middle School teams) are ranked in the top 15 in the state, and two of the teams are in the top 10 in the country. Sycamore's Nathan Keith was named the VEX Mentor of the Year for the state of Indiana. Is your young child curious and talkative? Does he or she have a good sense of humor, learn quickly? Does he or she remember everything that you ever promised? You may have a gifted child. 12 Signs: Do you have a gifted learner? If Sycamore School is to be closed due to extreme weather conditions, announcements to parents will be sent to home and cell phones via the school’s automated alert system. Announcements will also be made on local TV and radio stations and their websites. Closings will also be posted on the Sycamore School social media (Facebook and Twitter) feeds. We will also post information on this page.